Australian startup Canva today announced it has raised a $3 million seed round from top Australian and U.S. investors including Matrix Partners, InterWest Partners and 500 Startups. Sydney, Australia — 20/03/13 — Australian startup Canva today announced it has raised a $3 million seed round from top Australian and U.S. investors including Matrix Partners, InterWest Partners and 500 Startups. Accomplished angel investors Bill Tai, Director of Engineering at Facebook Lars Rasmussen, Yahoo! CFO Ken Goldman, and former Seek co-founder Paul Bassat and partner at Square Peg Ventures, have also backed the company. Commercialisation Australia contributed through its Early Stage Commercialisation program. Canva is a simple-to-use online collaborative design platform which allows anyone to create professional quality designs. It’s the second startup for Melanie Perkins and Cliff Obrecht, who previously launched online school yearbook design product Fusion Books in 2007, while studying at University. Cameron Adams, former lead designer at Google, has joined Canva as co-founder and Head of Product. 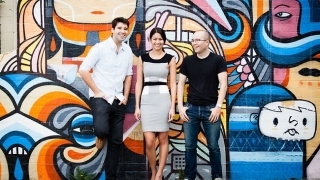 “We’re incredibly excited to announce Canva,” said CEO Melanie Perkins. “This significant seed round demonstrates confidence in our team, product, and vision.” Melanie said the $3 million in funding came about after Cliff and her attended the MaiTai kiteboarding and entrepreneur conference in Hawaii. While there, they were introduced to a number of prominent Australian and U.S. investors. “Our investors bring significant experience and expertise to the table and are accomplished entrepreneurs in their own right. These are people who’ve sat behind the wheel at some of Silicon Valley’s most successful tech companies,” she said. Commercialisation Australia CEO Doron Ben-Meir, commented: “It can be difficult for Australian companies to take innovative ideas to market. We’ve supported Canva because it’s a strong team with a truly innovative product and we think it has the potential to be a global success,” Rick Baker, partner at Blackbird Ventures, said Canva’s team was a sign of growing maturity in the Australian startup scene. “The desktop design industry is ripe for disruption and the Canva team are the best people for the job. The founders have attracted a stellar cast of international investors, and are proving you can launch a truly global company from Australia,” he said. Reserve your Canva username at www.canva.com. Zach is Head of Communications for Canva, an online platform that makes graphic design simple for everyone. He writes regularly on social media, branding and public relations and has achieved coverage in publications including Mashable, TechCrunch, PandoDaily, NBC, Forbes and The Next Web.